India takes historic step to fight corruption, black money, and counterfeit currency. From 8th November 2016 midnight old Rs.500 and Rs.1000 notes will no longer be valid. New Rs.500 and Rs.2000 notes will be issued from 10th November 2016. It is very bold and decisive step taken by Shri Narendra Modi to fight against black money. Why Rs 500 and Rs 1000 Notes are scrapped? The reasons for withdrawal of legal tender of Rs.500 and Rs.1000 Notes are given below. This is definitely welcome step by the government. If you are holding Rs. 500 or Rs 1000 notes you must go through following important points. You can exchange this notes through Bank, Post office or RBI offices. You will get the full value of the entire volume of notes. However, you will get Rs.4000 per person in cash. The remaining amount will be credited to the bank account. You need to produce valid identity proof such as PAN Card, Aadhar Card, Passport copy in order to exchange the notes. You can go to any bank. You need to furnish valid ID proof and account details for the money transfer. Apart from the exchange, you can directly deposit this notes to your bank account. However, all this money will come under a tax regime. There is no limit on the amount to be deposited in bank account. If you don’t have account you can use bank account of your friend or relative. However, you need permission in writing from account holder for this transaction. It is preferred that you visit personally to bank. If you are unable to visit personally you can send your representative with authority letter and valid ID proof. This scheme will be open till 30th December,2016. If you are unable to exchange or deposit bank notes before 30th December,2016 you can submit the notes to RBI up to 31st March,2017 by specifying valid reason. You need to use request slip for the exchange of old high denomination bank notes. You can download the request slip from here. If you are not in India you can authorize a person in India to deposit the old notes into your bank account. The person should produce valid ID proof while visiting bank. For more information about this you can visit FAQ section given on RBI website. 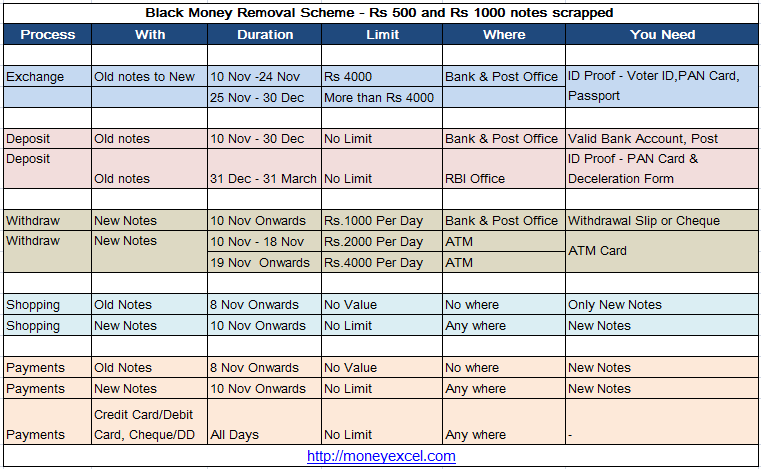 Master Stock of removing high denomination notes Rs.500 and Rs.1000. What a strategy and plan. Truly Amazing Hats off…Legendary Leader Mr.Modi ! Now only two options left either deposit old notes in the bank account or forget it. And what the result we can expect on market . will it boost more then the yesteryear in just one year by taking this step of our P.M. Mr. Modi . And is it the right time to invest for getting good returns in next 2 or 3 years what you would say. Yes! Schematic approach is the most important thing to be looked out at ! It’s a strategic planning, through study, systematic move, analysis of present situation, finding right solutions, exact calculations of pro s & cons. Excellent management approach to reduce cons. Amazing brains , amazing mind! I am proud of all the Indians, this is what we elected PM Modi …. ! Grand cheers ! We are talking of curbing corruption. I am just willing to be taught a few things. Very Good question. My thoughts are given below. (1) Government may bring scheme to reduce cash transaction. (2) Money Declared under this scheme will be liable for tax payments & scrutiny.Once you come under tax bracket it is unlikely to move away from it. (3) Due to extra money flow tax rate will decrease. As salaried people has more money they will not end up in corruption.